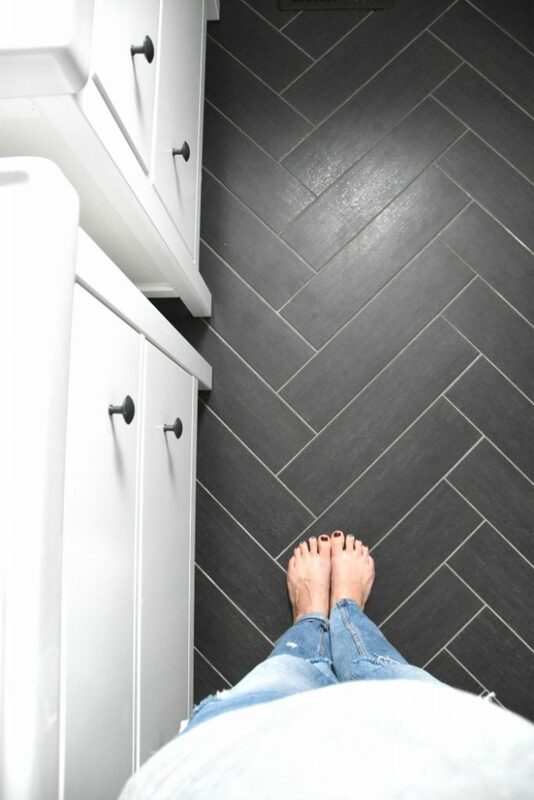 One of the first things we needed to tackle in our master bathroom makeover were the floors. In case you missed it, here are the before pictures and the design plans for the space. Since the bathroom is really large, we needed the tile to be both budget friendly and not insanely time consuming to lay. With two kids in tow, we aren’t able to DIY as much as we used to. To lay these floors, we decided to use our tile guy for the job, who charges by the hour. You may remember that in our kids/guest bathroom that we did herringbone tiled floors. We love them, but I knew that doing something so intricate in this big of a space was a no-go. It would take ages to lay and just be too expensive. Plus, we’d done it already so I was ready for something different! 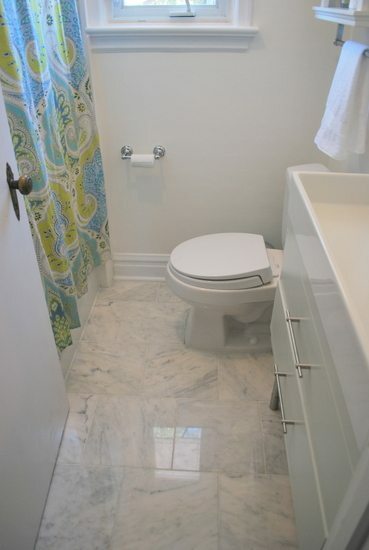 In our previous downstairs bathroom (pre-renovation), we had laid some carrara marble 24 x 24 tiles ourselves. I loved their classic look, and although we worried about them being slippery when wet, it wasn’t an issue at all. 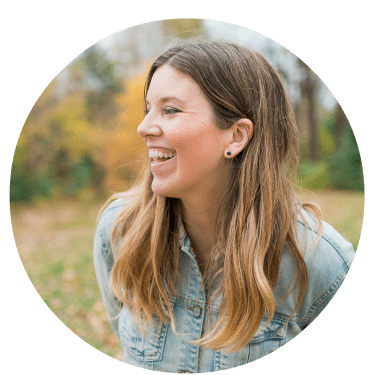 We were actually really bummed when they were damaged beyond repair during the reno. 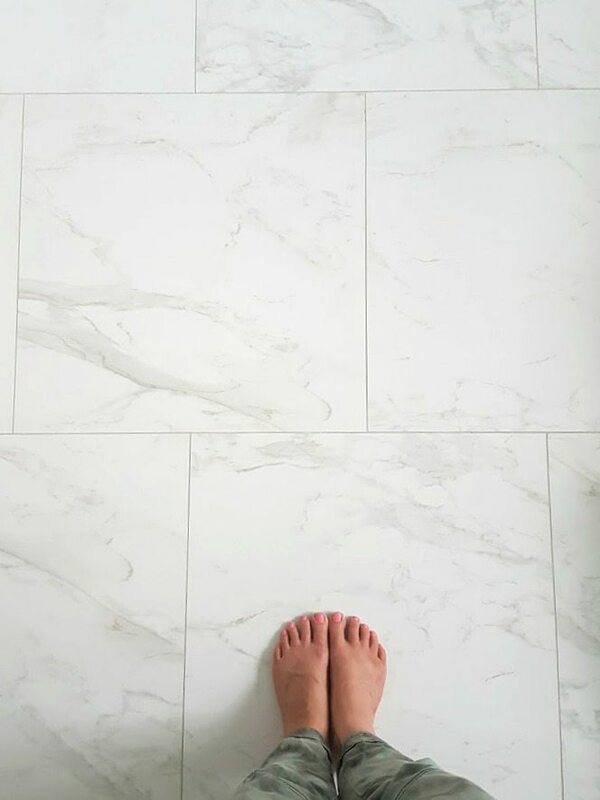 I loved the marble look, but also loved that they would be durable (as ceramic tiles generally are), and were waaaay cheaper than the real deal (less than $2/square foot). The large size of the tile not only suited the big room, but meant they were very quick to lay. It was a fast job for our tile contractor. Watching him and his assistant work was amazing – it would have taken Dan and I AGES to get this floor done and they just whipped through it so quickly and professionally. I’m not trying to harp on our DIY skills, but in this instance it was so nice to pay someone else to do the job. I went with a medium gray grout called “Silverado”. 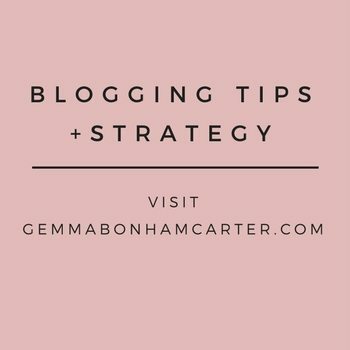 Tip? Don’t ever do white grout on a floor. It’s impossible to keep clean. I learned that the hard way with our first bathroom reno. Unfortunately since these were a sale item, I don’t have a link for you to get the exact same ones. I would just recommend that you hit up your local tile shop and check out what they have in person. 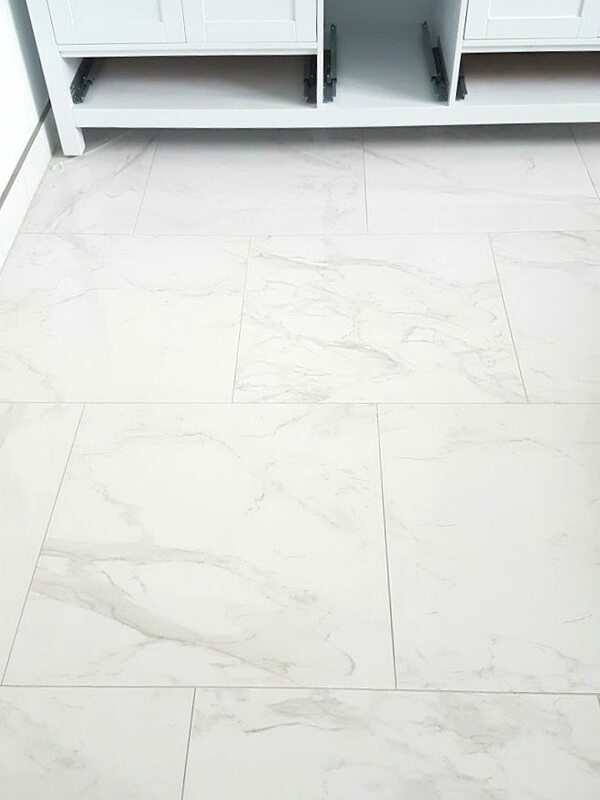 The other option is to check online – like all of this marble tile, searching around can lead to a bunch of tile sellers who ship. 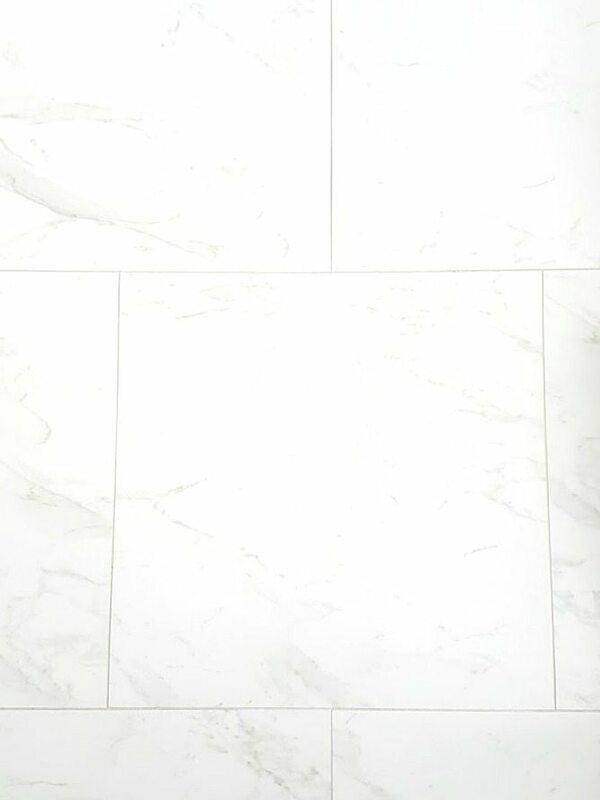 From my experience, pretty much anything that is or looks like carrara marble is a win. It’s so classic and just looks good in any space. Next up in the bathroom reno? Installing the vanity. You can see in one of the pics above that we have gotten started – it’s the Sheffield double vanity from Home Depot! You have no idea how giddy we are at the thought of actually getting to use this space – it’s been sitting there unfinished for over two years! These are such beautiful tiles! They look like the read deal! Right?! They totally do! I was so excited to find them in the clearance section. We are about to embark on a bathroom reno – any recommendations for contractors?! And jobs you would leave to the pros vs jobs you found manageable to do yourselves?! We really liked Omar from Nice Guy Plumbing as our plumber! I would say that you can do things like paint, install vanities, replace toilets, etc. on your own, but potentially get someone to do your tile work and plumbing! If you want to try your hand at laying floor tile, it’s do-able, but watch some youtube videos before getting started and I would buy the pre-mixed grout so that it’s the right consistency. Wow! Thanks for sharing all of them are wonderful. I really liked your insight. I was looking for bathroom marble floor tiles. It’s a great help. I saw these at a tile store and almost bought them but then got convinced to splurge and get real marble 2″ hex for our bathroom floor. Boy, do I wish I had gone with the tile! Our contractors ignored the grey unsanded grout from the tile store that I literally put in their hands, and instead used some sanded grout in a hideous off white. Then the tiles were all scratched from the sanded grout, the yelowish grout looked like it had years of pee stains and it was cupping, and we hadn’t even used the bathroom yet. They promised to remove the grout and regrout it, but only damaged the tiles and now (after firing them), we are just going to rip the whole thing out. 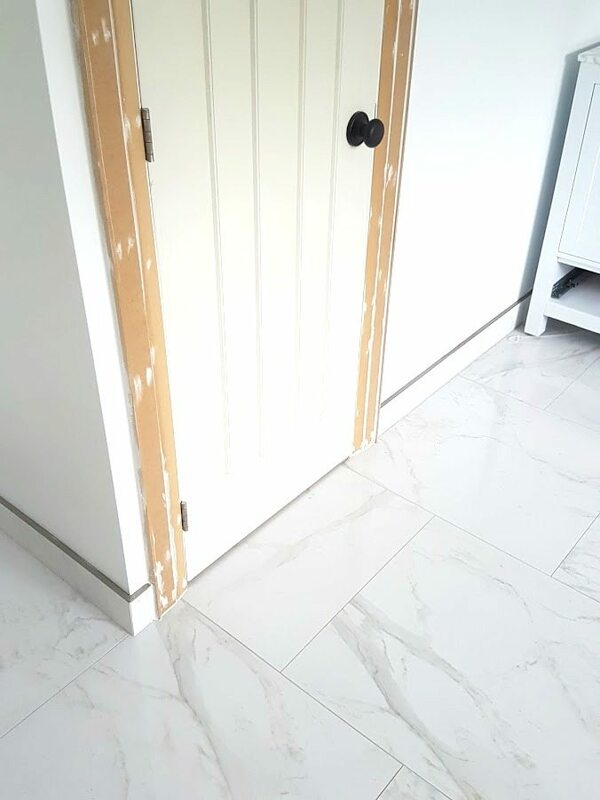 Thing is, now when we put down the tile we liked in the first place, (your tile), the bathroom floor will be slightly lower than the adjoining wood floor in our master, because of the difference in thickness. We have to make sure to get the right thickness of thinset or else we lose the perfect height match we had with the marble. You made the right decision and your bathroom looks great. I will never pick real marble for a floor ever again, ever, never, ever.